Every writer across the globe have a lot to share with people all around. So today in our series of Superhero with Ink we have Ering whose words are like the words of healing. Let’s hear it from her! 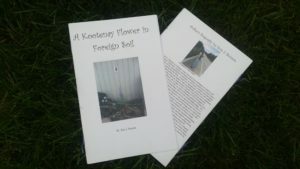 I tend to do a lot of events, so I thought it would be good to have a book that I could give or sell to people when I was asked for one, so I self-published the chapbook “A Kootenay Flower in Foreign Soil”. I didn’t really have a theme in mind when I was selecting the poems. I just knew that when I created it, I wanted it to be a reflection of me as a person and a poet, and I wanted it to demonstrate my range as word artist, so I tried to include works that were not related to each other in terms of form or content. There is definitely one or two poems that I would leave out if I could do it over again, but I think there is something in there for everyone to enjoy as well, which is not bad for a first book. I grew up in a small town with a father who loved nature and politics and a mother who wrote protest songs, and songs about navigating your way through life’s emotional moments. I was born in Saskatchewan, and apparently even lived in a commune there with my parents as a toddler. My father worked at a job where he helped employees of various companies to form unions, and on the side, he assisted a First Nation’s organization in fighting for their land and treaty rights. Even the music and nature were a huge part of my life at events we attended in the First Nation’s community and in other parts of our community, but when I was about six we took a vacation to the Kootenays. While my mom was sleeping in at the Ainsworth motel, I and my Dad drove to Kaslo and bought a house. Two months later we were all residents of Kaslo B.C., and my parents still live in my childhood home. It was definitely an adjustment for my mother; a bonafide city girl who was told by a colourful local she asked shortly after our arrival that the population of her new community consisted of : “500 people, 500 hippies and 1000 dogs”. I can’t say that local was completely wrong, some of my friends, when I was a kid, were the random dogs, whose names everyone knew, that walked themselves around town whenever they wanted. Still, you only have to spend five minutes in Kaslo to understand that you are somewhere sacred. The actual population has always hovered around 1500 people, so not a lot goes on, but in a village nestled in a valley on Kootenay Lake, no one really cares about that. I spent my teen years exploring the surrounding mountains, rivers, marshes and lakes; finding out who I was to the tune of guitars and bongo drums played long into the night around beach bonfires. I moved to Kelowna at the age seventeen, and began pursuing my education while supporting myself as a waitress. Kaslo is a predominantly white community, so it was good to get out and see the diversity that actually makes up our world, even if Kelowna is one of the more homogenized cities in B.C. Eventually I met a boy from Castlegar—also a small community in the Kootenays—andwe moved to Prince George together to get educated so we could move back to the Kootenays and raise a family together, but we all know real life fairy tales rarely come true. Even though we are still friends, that relationship ended a long time ago. He moved to Vancouver to pursue his career as an electrician, and I stayed behind to finish my education. grateful for the strong influence the First Nation’s people in this area have on the culture of Prince George. It brought back so many memories for me of events I attended with my dad as a kid that involved music and dancing and food and so much celebration. I am glad Prince George reconnected me to the part of myself that was shaped by those early experiences. I guess a part of my artistic background I should also mention is the fact that when I was a kid my mom and I used to perform as a folk singing duet, and we even made an album called “Voices of Change, by Erin and Gail.” I wrote and co-wrote one of the songs on the album before I turned eight. I think I was about ten when we recorded it together in the nearby community of Argenta, which is actually smaller than Kaslo, and no longer has a recording studio. I hadn’t thought about that album much until recently, but it came up that I sang once, and again I was asked, so I burned some copies and gave them away to friends and some of the students I worked with at my tutoring job. That has led to some unexpected experiences including a drunken sing along with a buddy of mine while we were walking around one night looking for Northern Lights, and an experience I think I will never forget even though it was so simple. I was about to go grocery shopping when I ran into an ex-student who had come with an exuberant personality and expressed a liking for the album shortly after I gave it to her. Two years later she started singing “Round and Round” to me in the parking lot of our local Superstore, which is an incredible song my mother wrote from our album. That really touched me, and even though I’m not as musical anymore, it really reminded me why I write and perform. My creative side kind of took a break while I was writing academic papers at university. I produced some great stuff in my creative writing classes, but overall wasn’t producing the quantity or kind and quality of work I had as a teenager. I experienced a small resurgence when I turned thirty and decided it was time to put my education to work and give up waitressing. I ended up having a period where I wasn’t employed at all. 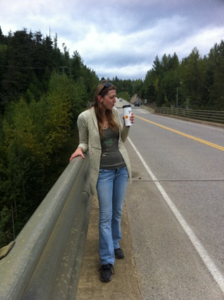 In that time I took a trip to Kaslo, and on the drive back with my friend I got half way through writing a novella about a young girl finding herself and negotiating a more mature relationship with her mother. It made the finals in a screenwriting contest, and the overall experience reminded me that writing isn’t something I want to do: I write so my soul doesn’t die. I am only now nearing the end of my educational pursuits, and still paying off debt for my education, but I had about 400 poems and three stories just sitting there, so I decided to start promoting myself. I got a gig at a music festival, and realized I had to have some kind of promotional material to leave people with besides a piece of paper, and I work at a place where I have cheap access to a photocopier, so I put together my book. The cover photo is one I took with my phone camera behind a mechanics shop near a restaurant I worked at. Like me, the flower is growing in an odd place, so it seemed fitting. The photo on the back was taken by my best friend Cheryl Roper, who should be a visual artist, but is happy doing other things. She is still one of the only people who can take a photo of me that I don’t hate, and I feel like she often captures me on film in a way that no one else can, but I guess thirty years of friendship can have that effect. I’m currently working on a few novels, and I am starting to put together my second chapbook called “Wordpower”, which will feature my pieces that focus on social and environmental justice issues I think we should all pay attention to. To my surprise I also finished a short story about a young girl shaving her legs for the first time that I really want to see in print. I started thinking about how you could incorporate activist philosophies into things that weren’t poetry, and it just poured out of me last Saturday morning. The only reason I was surprised is because I am currently taking two online courses, and working two non-writing related jobs, on top of being active in two social justice organizations in my community. It’s a pretty busy time for me, and now that I have started promoting myself I get asked to do a lot more events, so I have to confess I haven’t written a lot of anything this year besides that story and a few poems that I am pretty happy with(lol). I also lost both of my dogs this year. They were fourteen and fifteen, and along with the cat I still have, they were the loves of my life. I have written some grief stricken ramblings about that, one that made it onto my poetry page, but not really much I want to, or should, really use in public. I write at least one morning page every day to keep my writing muscle active though, and after last weekend I am confident I’ll make some serious headway on my novel during my time off this summer. My mom tells me I used to dictate stories to her on long bus rides around Saskatchewan when I was three, but the first thing I really remember writing was a poem that got posted in the hallway of my school when I was about eight. It was about being an abused kid, even though my childhood was much more wholesome than a lot of people’s were, and not what I would in any way term abusive. I remember seeing my name on the wall underneath my words, and having people tell me how I had inspired them to think about the issue, and I was hooked. Jerry Spinelli, Jerry Spinelli, and Jerry Spinelli (lol). Seriously though, I really enjoy the way Amy Tan develops her characters. You really fall in love with them, and get invested in their stories. I also loved ArhundatiRoys first novel “God Of Small Things”, and I am so glad she is writing fiction again after such a long hiatus, but no one is Jerry Spinelli. I have about fifteen of his books for children and young adults, I have read them all, and I don’t know if he intends to, but he writes in a conversational style that makes you feel like you are a part of the action. He also doesn’t assume kids are stupid, or try to play to their unfortunately budding consumeristic sides. He writes about real issues like race, poverty, being an orphan, and just plain trying to be a kid and grow up in ways that are so insightful and funny that if you don’t laugh and cry your way through his novels you must be robot. Marge Piercy wrote pretty much all my favorite poems. Her book Living in the Open really showed me how much emotion and expression you can fit into basically the space of a paragraph, and reading it as a teen really cemented my love of poetry and my desire to create emotional and significant pieces like hers. I would have to say Brad Cran’s poem “Death of a Friend by Overdose” is my all-time favorite poem though, as I had a few friends die from drug related incidents or accidents, and that poem made me feel like someone understood what I was feeling. I am working on a retelling of the lives of some biblical characters. It is a story that has been in my head for about ten years, and probably won’t be completely on paper for at least five more, and I really want to shock everyone when it comes out, so I won’t say more right now. 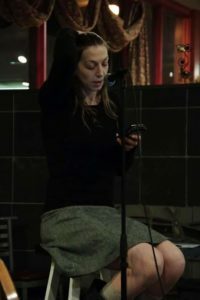 In the meantime I plan to transition into my full time writing career by continuing to host, organize and perform at events and workshops, as that seems to be working really well for me at the moment, and I love inspiring others to write or be creative. I think I would have to say trying new creative things is a hobby of mine. I have a lot of hobbies that come and go alongside writing. I recently grabbed my childhood ukulele from my parent’s house, and once I can afford to restring it I am going to pick it up and see what happens. I do yoga at least five days a week by myself in the morning, and I’m pretty sure my soul would also die if I stopped doing so. I also meditate every morning. I started drawing with charcoal to make visual expressions of some of my poems awhile ago, and the cover illustration on WordPower is something I drew myself. I wouldn’t call myself a visual artist by any means, but the image gets my point across, and that’s what really matters. I like Lynda Barry’s philosophies on creativity, and I would have to say she also influences my written, and other, artwork. I once made a floor length skirt for myself out of the top off of an old pair of jeans and t-shirt patches from old shirts of mine and my friends, and I have a few other pieces of clothing I’m making for myself. Like my novel, one of them has been ten years in the making, and I’m still not sure when I’ll wear it as I sew by hand which takes motivation and patience. In the summer I hike and camp and hula hoop dance between all the free outdoor music I am lucky enough to experience in my community. I have skates and skis I’ve used in winter too, but my non-writing-related -jobs are only open in the winter, so I tend to be pretty busy during those months and not active in a lot of hobbies. One of the things I love about Eggs is that in reading the jacket I learned that Mr. Spinelli started the book, and then forgot about it for ten years in a closet until his wife asked him about it one day. He pulled it out and added a brilliant finish. He blows me away with the depth of emotion and character development that draws you into his stories. He definitely understands how to use metaphors and other forms of figurative language throughout his books, but hisstyle is still not too complex for the average reader either. Read your work, talk about your work, send it out, then talk about it more. Always be talking about your work, and have samples to give away. Definitely don’t give away too much, but have some pieces ready for this purpose, and be willing to do some reading for free in the beginning to build experience.